SAN FRANCISCO - Jeff Samardzija and Robbie Ray both had filthy stuff Tuesday night, one from the right side and one from the left. They each recorded 20 outs with similar lines, but there was one big difference. 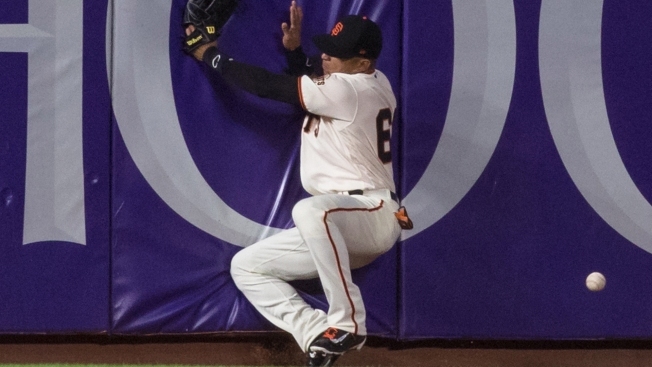 Ray caught the break he needed, Samardzija did not. In the end, Samardzija and the Giants were left with a 4-3 loss on a wet night at AT&T Park. Playing without Buster Posey for the first time, the lineup didn't get going until the ninth, when Nick Hundley and Eduardo Nuñez got the Giants within one. Brandon Crawford struck out with the tying run on second. The game turned on a couple of plays at the track involving Gorkys Hernandez. Starting in place of Denard Span against the lefty, Hernandez came up with the bases loaded and two outs in the second. His deep fly to left was caught a few feet in front of the wall. The Diamondbacks came right back and loaded the bases in the top of the third, starting with a single by Ray. Jake Lamb crushed a fastball to left-center and Hernandez seemed to have it in his sights. As he approached the wall, he stumbled a bit, and his reach came up a few inches short. The triple made it 3-0 Diamondbacks. That was the only damage against Samardzija, who put plenty of traffic on the bases but limited the damage. Samardjiza allowed five hits and walked four in 6 2/3 innings, striking out seven. Ray gave up four hits, walked five and struck out eight. Starting pitching report: On the day Posey went on the concussion DL, Samardzija drilled Paul Goldschmidt, Arizona's best player. It didn't seem to be an accident. The pitch was a 96 mph fastball that struck him on the backside, the desired spot for retaliatory throws. Goldschmidt walked to first without incident. Bullpen report: Ty Blach was in full LOOGY mode. He came on in the seventh with a runner on and Lamb up, getting a liner to right that ended the inning. At the plate: Hundley will get most of the starts over the next week. He had a single and two doubles in five at-bats. In the field: Nuñez made his first start of the year at shortstop. He didn't get a chance until the seventh, and he handled it easily. He'll be Crawford's backup this year. Attendance: The Giants announced a crowd of 41,562 human beings. One of them wore an Aaron Roward jersey. Apparently on purpose. Up next: Matt Cain makes his second start of the year. Given the fact that the Giants can skip their No. 5 starter next week, it's a big one for Cain.